The MultilingualWeb-LT Working Group has published a W3C Recommendation of Internationalization Tag Set (ITS) Version 2.0. 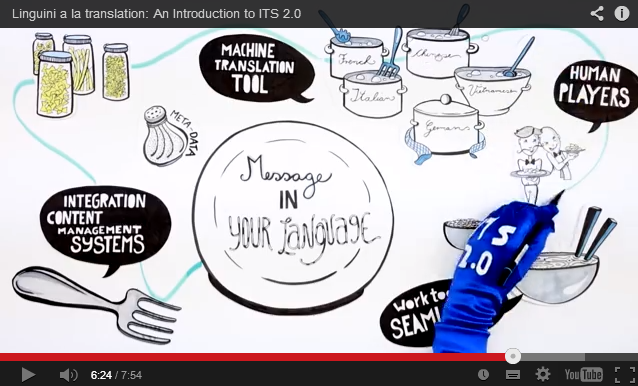 ITS 2.0 provides a foundation for integrating automated processing of human language into core Web technologies. ITS 2.0 bears many commonalities with its predecessor, ITS 1.0, but provides additional concepts that are designed to foster the automated creation and processing of multilingual Web content. Work on application scenarios for ITS 2.0 and gathering of usage and implementation experience will now take place in the ITS Interest Group. Learn more about the Internationalization Activity. Following the delivery of this standard, on 17 January 2014 the MultilingualWeb-LT Working Group was officially closed. But what exactly does ITS 2.0 do, and is it relevant to the interests of institutional web managers, or research, teaching or administrative departments within institutions? The video, an animated cartoon, is interesting because of the informal approach it takes to explaining the standard. This, in my experience, is unusual. The approach may not be appreciated by everyone but since standards are widely perceived to be dull and boring, although still acknowledged as important. For me, providing a summary of the importance of standards in this way can help to reach out to new audiences who might otherwise fail to appreciate the role which standards may have. If you are involved in providing web sites or content which may be of interest to an international audience it may be worth spending 8 minutes to view this video. If ITS 2.0 does appear to be of interest the next question will be what tools are available to create and process ITS 2.0 metadata? A page on ITS Implementations is available on the W3C web site but again this is rather dry and the tools seem to be rather specialist. However more mainstream support for ITS 2.0 is likely to be provided only if there is demand for it. So if you do have an interest in metadata standards which can support automated translations and you feel ITS 2.0 may be of use, make sure you ask your CMS vendor if they intend to support it. The University of Bath is based in a beautiful georgian city: Bath. L’université de bain est basé dans une belle ville géorgienne: bain. Welcome to Bath’s art museum for everyone. Bienvenue au musée d’art de salle de bain pour tout le monde. Perhaps marketing people in many organisations who would like to ensure that automated translation tools do not make such mistakes should be pestering their CMS vendors for ITS 2.0 support! 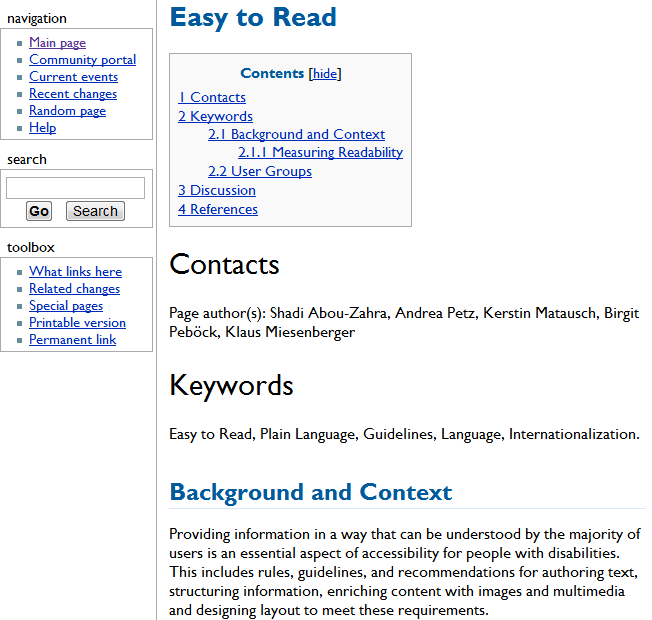 “John hit the ball”: Should Simple Language Be Mandatory for Web Accessibility? The W3C/WAI Research and Development Working Group (RDWG) is planning an online symposium on “Easy to Read” (e2r) language in Web Pages/Applications“ (e2r Web). The closing date for submissions (which can be up t0 1,000 words) is 24 September 12 October 2012. The symposium itself will take place on 3 December 2012. Providing information in a way that can be understood by the majority of users is an essential aspect of accessibility for people with disabilities. This includes rules, guidelines, and recommendations for authoring text, structuring information, enriching content with images and multimedia and designing layout to meet these requirements. Easy to Read today is first of all driven by day to day practice of translating information (on demand). More research is needed to better understand the needs of the users, to analyze and compare the different approaches, to come to a common definition, and to propose a way forward in providing more comprehensive access to language on the Web. Guideline 3.1 Ensure that the meaning of content can be determined. For example, the simplest sentence-form for English consists of Subject-Verb-Object, as in John hit the ball or The Web site conforms to WCAG 2.0. Using bulleted or numbered lists instead of paragraphs that contain long series of words or phrases separated by commas. Using single nouns or short noun-phrases. Yes, if that version of the WCAG guidelines had been implemented if you wished your Web site to conform with WCAG Level 3 you would have had to ensure that you avoided complex sentences! Such guidelines would be helpful for people with cognitive disabilities: those with Asperger’s syndrome, for example, find it difficult to understand metaphors such as “It’s raining cats and dogs“. The guidelines seem to have been developed by those who wished to implement the vision of “universal accessibility“. But I think we can see that seeking to address accessibility in this fashion is flawed. I have to admit that I would be worried if the Easy to Read research activities were to lead to enhancements to the WCAG guidelines. Under the current WAI model, full conformance to WCAG, together with ATAG and UAAG guidelines is supposed to lead to universal accessibility. There is also an assumption that universal accessibility is a desired goal. But is this really the case? The early drafts of WCAG 2.0 guidelines suggested that “John hit the ball” conformed with the goal of ensuring that the meaning of the content can be determined. Would WCAG 2.0 checking tools flag “the ball was hit by John” as an accessibility error, meaning that the Web page could not achieve the highest accessibility rating? And what about my favourite sports headline: “Super Caley Go Ballistic Celtic Are Atrocious” – a headline which brings a smile if Mary Poppins was part of your cultural background and you recognise Celtic as a football team, but which is clearly not universally accessible. I would welcome research into ways in which styles of writing can enhance the accessibility of the content to people with disabilities. My concern would be if such research were to be incorporated into future versions of WCAG guidelines – especially if WCAG conformance is mandated in legislation, as is the case in some countries. But rather than failing to carry out such research, I feel the main challenge for WAI is to re-evaluate its underlining model based on the triumvirate of standards and its commitment to ensuring that Web resources are universally accessible – this might be a great soundbite, but in reality may be an unachievable – and even undesirable – goal. After all ‘universal accessibility’ doesn’t appear to allow for any contextualisation and an important aspect of accessibility must surely be the context of use. What do you think? This plenary will begin with a report on work on privacy and identity in the EU FP7 PrimeLife project which looks at bringing sustainable privacy and identity management to future networks and services. There will be a demonstration of a Firefox extension that enables you to view website practices and to set personal preferences on a per site basis. This will be followed by an account of what happened to P3P, the current debate around do not track, and some thoughts about where we are headed. The Firefox extension mentioned in the abstract is known as the ‘Privacy Dashboard’ and is described as “a Firefox add-on designed to help you understand what personal information is being collected by websites, and to provide you with a means to control this on a per website basis“. The output for a typical home page is illustrated. The dashboard was developed by Dave Raggett with funding from the European Union’s 7th Framework Programme for the PrimeLife project, a pan-European research project focusing on bringing sustainable privacy and identity management to future networks and services. In order to observe patterns of UK Universities practices in online privacy I have used the W3C Privacy Dashboard to analyse the home pages of the twenty UK University Russell Group Web sites. The results are given in the following table. It should be noted that the findings appear to be volatile, with significant differences being found when the findings were checked a few days after the initial survey. Working Drafts of the HTML5 specification, the accompanying explanatory document HTML5 differences from HTML4, and the related non-normative reference HTML: The Markup Language. Back in August 2010 in a post entitled New W3C Document Standards for XHTML and RDFa I described the latest release of RDFa Core 1.1 and XHTML+RDFa1.1 draft documents. The RDFa Working Group has now published Last Call Working Drafts of these documents: RDFa Core 1.1 and XHTML+RDFa 1.1. The W3C has also recently launched a new Provenance Working Group whose mission is “to support the widespread publication and use of provenance information of Web documents, data, and resources“. The Working Group will publish W3C Recommendations that define a language for exchanging provenance information among applications. This is an area of work which is likely to be of interest to those involved in digital library development work – and it is interesting to see that a workshop on Understanding Provenance and Linked Open Data was held recently at the University of Edinburgh. When I first read of the Multimodal Interaction (MMI) Working Group‘s announcement of the Last Call Working Draft of Emotion Markup Language (EmotionML) 1.0. I checked to see that it hadn’t been published on 1 April! It seems that “As the web is becoming ubiquitous, interactive, and multimodal, technology needs to deal increasingly with human factors, including emotions“. The six terms proposed by Paul Ekman (Ekman, 1972, p. 251-252) as basic emotions with universal facial expressions — emotions that are recognized and produced in all human cultures: anger; disgust; fear; happiness; sadness and surprise. Mehrabian proposal of a three-dimensional description of emotion in terms of Pleasure, Arousal, and Dominance. Standards for Web Applications on Mobile Devices: the (Re)birth of SVG? This document summarizes the various technologies developed in W3C that increases the power of Web applications, and how they apply more specifically to the mobile context, as of February 2011. The first area described in this document is Graphics and since the first standard mentioned in SVG the note of caution needs to be borne in mind. As discussed in a post published in November 2008 on “Why Did SMIL and SVG Fail?” SVG (together with SMIL) failed to live up to their initial expectations. The post outlined some reasons for this and in the comments there were suggestions that the standard hasn’t failed as it is now supported in most widely-used browsers, with the notable exception of Internet Explorer. In January 2010 I asked “Will The SVG Standard Come Back to Life?” following the announcement that “Microsoft Joins W3C SVG Working Group“ and an expectation that IE9 will provide support for SVG. This was subsequently confirmed in a post with the unambiguous title “SVG in IE9 Roadmap” published on the IE9 blog. SVG, Scalable Vector Graphics, provides an XML-based markup language to describe two-dimensions vectorial graphics. Since these graphics are described as a set of geometric shapes, they can be zoomed at the user request, which makes them well-suited to create graphics on mobile devices where screen space is limited. They can also be easily animated, enabling the creation of very advanced and slick user interfaces. But will SVG’s strength in the mobile environment lead to a fragmented Web in which mobile users engage with an SVG environment whilst desktop users continue to access HTML resources? I can recall suggestions that where being made about 10 years ago which pointed out that since SVG is the richer environment it could be used as a generic environment. Might we see that happening? After all, as can be seen (if you’re using a browser which supports SVG) from examples such as the Solitaire game (linked in from the Startpagina Web site which provides access to various examples of SVG uses) it is possible to provide a SVG gaming environment. Might we see Web sites like this being developed? I recently described the confusion over the standardisation of HTML5, with the WhatWG announcing that they are renaming HTML5 as ‘HTML’ and that it will be a ‘Living Standard’ which will continually evolve as browser vendors agree on new features to implement in the language. I welcome this announcement as I feel that it helps to address recent uncertainties regarding the governance and roadmap for HTML developments. The onus is now on institutions: there is now a clear roadmap for HTML5 development with a stable standard currently being finalised. As providers of institutional Web services, what are you plans for deployment of HTML5? Membership of W3C working group comprises W3C staff as well as W3C member organisations, which includes the JISC. In addition it is also possible to contact working group chairs and W3C team members in order to explore the possibility of participation as an invited expert. Note that a list of W3C Working Groups, Interest groups, Incubator Groups and Coordination Groups is provided on the W3C Web site. The Working Groups are typically responsible for the development of new W3C standards (known as ‘recommendations’) or the maintenance of existing recommendations. There are quite a number of working groups. including working groups for well-known W3C areas of work such as HTML, CSS and WAI as well as newer or more specialised groups covering areas including Geolocation, SPARQL, RDF and RDFa. W3C Interest Groups which may be of interest include Semantic Web, eGovernment and WAI. Similarly Incubator Groups which may be of interest to readers of this blog include the Federated Social Web, Library Linked Data, the Open Web Education Alliance and the WebID groups. The W3C Process Document provides details of the working practices for Working Groups, Interest Groups and Incubator Groups. If anyone feels they would like to contribute to such groups I suggest you read the Process Document in order to understand the level of committment which may be expected and, if you feel you can contribute to the work of a group, feel free to contact me. … standards that are continuously updated as they receive feedback, either from Web designers, browser vendors, tool vendors, or indeed any other interested party. It also means that new features get added to them over time, at a rate intended to keep the specifications a little ahead of the implementations but not so far ahead that the implementations give up. What this means for the HTML5 marketing activities is unclear. But, perhaps more worrying is what this will mean for the formal standardisation process which W3C has been involved in. Since it seems that new HTML(5) features can be implemented by browser and tool vendors this seems to herald a return to the days of the browser wars, during which Netscape and Microsoft introduced ‘innovative’ features such as the BLINK and MARQEE tags. What this move effectively means is that HTML (5) will be implemented in a piecemeal manner, with vendors (browser manufacturers/AT makers etc) cherry picking the parts that they want. … This current move by the WHATWG, will mean that discussions that have been going on about how best to implement accessibility features in HTML 5 could well become redundant, or unfinished or maybe never even implemented at all. Browsers have always implemented standards piecemeal because implementing them completely is simply not doable. I do not think that accepting reality will actually change reality though. That would be kind of weird. We still want to implement the features. Specifications have been in flux forever. The WHATWG HTML standard since 2004. This has not stopped browsers implementing features from it. E.g. Opera shipped Web Forms 2.0 before it was ready and has since made major changes to it. Gecko experimented with storage APIs before they were ready, etc. Specifications do not influence such decisions. W3C announced the publication of WAI-ARIA 1.0 as a W3C Candidate Recommendation on 18th January 2011. A Candidate Recommendation (CR) is a major step in the W3C standards development process which signals that there is broad consensus in the Working Group and among public reviewers on the technical content of proposed recommendation. The primary purpose of the CR stage is to implement and test WAI-ARIA. If you are interested in helping or have additional comments you are invited to follow the content submission instructions. It does occur to me that in light of the significant development work we are seeing in areas such as repositories, e-learning systems, e-research, etc. there may be examples of developments which have enhanced the user interface in ways which enhance access for users with disabilities. If you have made use of WAI-ARIA 1.0 techniques in the development of your services, as mentioned on the W3C blog, W3C WAI would welcome such feedback. Please note that the closing date for comments is 25th February 2011. Do you use library-related data — like reading lists, library materials (articles, books, videos, cultural heritage or archival materials, etc), bookmarks, or annotations — on the Web and mobile Web? Are you currently using social features in library-related information systems or sites, or plan to do so in the near future? We are particularly interested in uses that are related to or could benefit from the use of linked data. What new or innovative uses do you see (or envision) integrating library and cultural heritage data into applications on the Web and in social media? How are social features used in library-related information systems? What are the emergent uses of library-related data on the Web and mobile Web? enhance the use of library-related data in a social context? contribute to systems for sharing, filtering, recommending, or machine reading? support new uses we may not have envisioned or achieved yet? Some examples have been discussed in this thread . Please tell us more by filling in the questionnaire below and sending it back to us or to public-lld@w3.org, preferably before February 15th, 2011 (note the original email incorrectly had 2010). The information you provide will be influential in guiding the activities the Library Linked Data Incubator Group will undertake to help increase global interoperability of library data on the Web. The information you provide will be curated and published on the group wikispace at . We understand that your time is precious, so please don’t feel you have to answer every question. Some sections of the templates are clearly marked as optional. However, the more information you can provide, the easier it will be for the Incubator Group to understand your case. And, of course, please do not hesitate to contact us if you have any trouble answering our questions. Editorial guidance on specific points is provided at , and examples are available at . The message then goes on to provide the template for the use cases. I would think that there be a range of relevant examples of such use cases based on institutional developments and JISC-funded project and service developments. It would be very useful, I feel, if the UK higher education sector were to contribute to this call as this can help to ensure that W3C’s Linked Data work will be informed by the experiences and requires of our sector. I should add that I have come across examples of standardisation activities in the past which have reflected US approaches and which do are not easily implemented for UK working practices. If you are involved in such Library-related Linked Data activities I would encourage you to read the original requests and respond accordingly. Feel free to leave a comment here if you have contributed a use case. What this means is that the W3C can submit their specifications directly for country voting to become ISO/IEC standards. The aims are to help avoid global market fragmentation; to improve deployment within government use of W3C specifications and acceptance of a W3C specification when there is evidence of stability/market acceptance of the specification. There are three types of Working Group participants: Member representatives, Invited Experts, and Team representatives. Team representatives both contribute to the technical work and help ensure the group’s proper integration with the rest of W3C. The W3C have not yet defined the selection criteria for identifying which specifications suitable for submission. I think it will be interesting to see how the market acceptance criteria will be used. It will also be interesting to see what the timescales for such standardisation processes will be and whether the standardisation will be applied to recent W3C specification or older ones. It seems, for example, that the ISO/IEC 15445:2000 standard for Information technology — Document description and processing languages — HyperText Markup Language (HTML) , which was first published in 2000 and updated in 2003, is the ISO standardisation of the HTML 4.0 specification. We can safely say that HTML 4 does have market acceptance, but the market place has moved on with developers now interested in the HTML5 specification. Will the ISO standardisation take place several years after a standard has become ubiquitous, I wonder? The W3C have recently published a Proposed Recommendation of Mobile Web Application Best Practices. This document aims to “aid the development of rich and dynamic mobile Web applications [by] collecting the most relevant engineering practices, promoting those that enable a better user experience and warning against those that are considered harmful“. The closing dates for comments for this document is 19 November 2010. There is much interest in mobile Web applications within the UK Higher education sector, as can be seen from recent events such as the Eduserv Symposium 2010: The Mobile University, the FOTE10 conference and the Mobile Technologies sessions at UKOLN’s IWMW 2010 event. Much of the technical discussions which are taking place will address such best practices. Since an effective way of ensuring that best practices can be embedded is to publish such practices by a well-known and highly regarded standards body I feel it would be useful if those who are involved in mobile Web development work were to review this document and provided feedback. The Mobile Web Best Practices Working Group provides details on how to give feedback, through use of the public-bpwg-comments@w3.org mailing list. Note that an archive of the list is available. The W3C have recently announced that the RDFa API draft has been published. As described in the announcement “RDFa enables authors to publish structured information that is both human- and machine-readable. Concepts that have traditionally been difficult for machines to detect, like people, places, events, music, movies, and recipes, are now easily marked up in Web documents“. Enhanced Browser Interfaces: Dave is writing a browser plugin that filters product offers in a web page and displays an icon to buy the product or save it to a public wishlist. The plugin searches for any mention of product names, thumbnails, and offered prices. The information is listed in the URL bar as an icon, and upon clicking the icon, displayed in a sidebar in the browser. He can then add each item to a list that is managed by the browser plugin and published on a wishlist website. Data-based Web Page Modification: Dale has a site that contains a number of images, showcasing his photography. He has already used RDFa to add licensing information about the images to his pages, following the instructions provided by Creative Commons. Dale would like to display the correct Creative Commons icons for each image so that people will be able to quickly determine which licenses apply to each image. Automatic Summaries: Mary is responsible for keeping the projects section of her company’s home page up-to-date. She wants to display info-boxes that summarize details about the members associated with each project. The information should appear when hovering the mouse over the link to each member’s homepage. Since each member’s homepage is annotated with RDFa, Mary writes a script that requests the page’s content and extracts necessary information via the RDFa API. Data Visualisation: Richard has created a site that lists his favourite restaurants and their locations. He doesn’t want to generate code specific to the various mapping services on the Web. Instead of creating specific markup for Yahoo Maps, Google Maps, MapQuest, and Google Earth, he instead adds address information via RDFa to each restaurant entry. This enables him to build on top of the structured data in the page as well as letting visitors to the site use the same data to create innovative new applications based on the address information in the page. Linked Data Mashups: Marie is a chemist, researching the effects of ethanol on the spatial orientation of animals. She writes about her research on her blog and often makes references to chemical compounds. She would like any reference to these compounds to automatically have a picture of the compound’s structure shown as a tooltip, and a link to the compound’s entry on the National Center for Biotechnology Information [NCBI] Web site. Similarly, she would like visitors to be able to visualize the chemical compound in the page using a new HTML5 canvas widget she has found on the web that combines data from different chemistry websites. Importing Data: Amy has enriched her band’s web-site to include Google Rich Snippets event information. Google Rich Snippets are used to mark up information for the search engine to use when displaying enhanced search results. Amy also uses some ECMAScript code that she found on the web that automatically extracts the event information from a page and adds an entry into a personal calendar. Brian finds Amy’s web-site through Google and opens the band’s page. He decides that he wants to go to the next concert. Brian is able to add the details to his calendar by clicking on the link that is automatically generated by the ECMAScript tool. The ECMAScript extracts the RDFa from the web page and places the event into Brian’s personal calendaring software – Google Calendar. Although all of the use cases listed above provide sample RDFa markup the final example makes use of Google Rich Snippets for which there is a testing tool which illustrates the structure which is visible to Google. I have been using RDFa on my forthcoming events page for a while so using the Rich Snippets testing tool it is useful to see how the structure provided on that page is processed by Google. The testing tool does point out that “that there is no guarantee that a Rich Snippet will be shown for this page on actual search results“. As described in the Rich Snippets FAQ “Currently, review sites and social networking/people profile sites are eligible. We plan to expand Rich Snippets to other types of content in the future“. the fact that Google’s Rich Snippets are explicitly mentioned in the RDFa API draft document does seem to suggest commitment from a leading player which has a vested interest in processing structured information in order to improve the searching process. And of course the “ECMAScript code that [Amy] found on the web that automatically extracts the event information from a page and adds an entry into a personal calendar” suggests that such RDFa information can be processed today without the need for support from Google. Now does anyone know where Amy found this ECMAScript code? The W3C recently announced that they had launched Unicorn, which they described as “a one-stop tool to help people improve the quality of their Web pages. Unicorn combines a number of popular tools in a single, easy interface, including the Markup validator, CSS validator, mobileOk checker, and Feed validator“. An example of how this validation service works is illustrated, which is based on validation of the UKOLN home page. The default options provide validation of the HTML and CSS of the selected page together with any auto-discoverable RSS feeds. 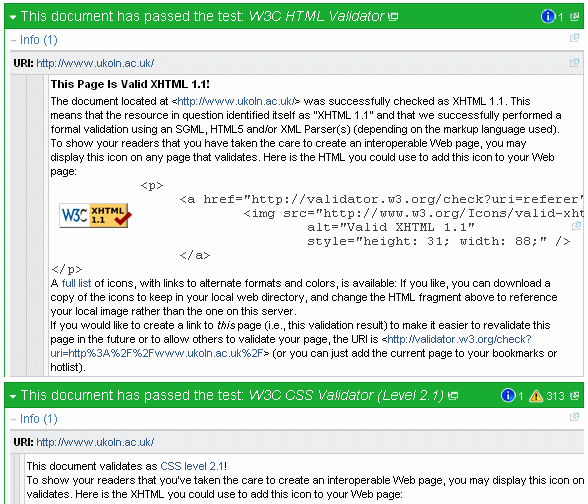 The interface to the validator is a Web form hosted on the W3C Web site. But encouraging use of such validation services would be much easier if the interface was more closely integrated with am author’s browsing environment, so that they didn’t have to visit an other page and copy and paste a URL. The UKOLN Web site has been configured to provide this ease-of-use. Appending ,unicorn to the UKOLN home page will invoke the Unicorn validator – and this option can be used on any page on the UKOLN Web site. I’m not sure how easy it may be to implement such extensions to Web servers these days; there may be policy barriers to such changes or perhaps technical barriers imposed by Content Management Systems. But I wonder if this simple approach might be of interest to others? Back in February 2010 the W3C announced a Candidate Recommendation Updated for Timed Text Markup Language (TTML) 1.0. This article referred to work being carried out by the W3C’s Timed Text Working Group which had been asked to produce a W3C Recommendation for media online captioning by refining the W3C specification Timed Text Markup Language (TTML) 1.0 based on implementation experience and interoperability feedback. This work is now complete with version 1.0 of the Timed Text Markup Language (TTML) 1.0 Proposed Recommendation having being published on 14 September 2010. Martin Hawksey’s iTitle Twitter captioning tool was an early example of an application which has exploited this emerging new standard. As described in the Twitter subtitling article in Wikipedia Martin “created a subtitle file from tweets in W3C Timed Text Markup Language (TTML) which could be used with the BBC iPlayer“. This example was initially used to provide Twitter captioning of the BBC/OU The Virtual Revolution programme followed by Gordon’s Browns talk on Building Britain’s Digital Future. It’s good to see this example of a prototype service which takes a proposed standard and demonstrates its value. Congratulations to Martin and RSC Scotland North and East. I’d be interested, though, to speculate on what other possibilities time text markup language applications may have to offer. Any suggestions anyone? The RDFa Working Group has just published two Working Drafts: RDFa Core 1.1 and XHTML+RDFa 1.1. RDFa Core 1.1 is a specification for attributes to express structured data in any markup language. The embedded data already available in the markup language (e.g., XHTML) is reused by the RDFa markup, so that publishers don’t need to repeat significant data in the document content. XHTML+RDFa 1.1 is an XHTML family markup language. That extends the XHTML 1.1 markup language with the attributes defined in RDFa Core 1.1. Meanwhile on 24th June 2010 the latest version of the “HTML5: A vocabulary and associated APIs for HTML and XHTML” working draft was published. Patrick Lauke’s talk on “HTML5 (and friends): The future of web technologies – today” generated a lot of interest at the IWMW 2010 event – but as I pointed out in the workshop conclusions session, there seems to be some uncertainty as to whether the focus for those involved in the provision of institutional Web services should be on the user interface developments provided in HTML5 or in use of HTML as a contained for reusable (linked) data which RDFa aims to provide. Of course for many the requirement will be to enhance the user interface (for human visitors) and provide access to machine readable data (for machines). The latter can be achieved in various ways but if you choose to go down the RDFa route a question then is: “Can you embed RDFa in HTML5 documents and, of so, how do you do this?“. The answer to this question is not (yet) clear. The W3C have published a “HTML5+RDFa: A mechanism for embedding RDF in HTML” working draft document – but this was released in July 2009 and hasn’t been updated since [Note that while this document on the dev.w3c.org Web site has not been updated or links to new versions provided, as described in a comment to this post a more recent document on HTML+RDFa 1.1: Support for RDFa in HTML4 and HTML5, dated 24 June 2010 is available – this comment added on 2 September 2010]. Microdata is being proposed as an extension of microformats which addresses deficiencies in microformats without the added complexities of RDFa. Should you start to migrate HTML documents from an existing HTML 4 or XHTML 1 environment to HTML5? The advice given by Patrick Lauke in his talk, as reported by @iwmwlive, was “If you want to take advantage of the new features, go ahead with HTML5, but don’t rush off to recode if you don’t need it“. But while much of the buzz surrounding the new features provided by HTML5 concern user interface developments (such as native support for video and enhanced forms validation) the future regarding use of HTML as a container for data seems to be somewhat uncertain. The best advice may be not to rush off to embed data in your HTML resource if you don’t need to. But as such advice can be a barrier to innovation if needs to be qualified by the suggestion that if you do wish to embed data using RDFa, microdata of microformats, you should ensure that you do so using a management system which will enable you to change the format you use if you discover that you have selected an approach which fails to take off. This advice is, of course, reflects the warning given in the draft documents – but not everyone reads such advice! In a recent post I outlined some thoughts on Microformats and RDFa: Adding Richer Structure To Your HTML Pages. I suggested that it might now be timely to evaluate the potential of RDFa, but added a note of caution, pointing out that microformats don’t appear to have lived up to their initial hype. Such reservations were echoed by Owen Stephens who considered using RDFa (with the Bibo ontology) to enable sharing of ‘references’ between students (and staff) as part of his TELSTAR project and went on to describe the reasons behind this decisions. Owen’s decision centred around deployment concerns. In contrast Chris Gutteridge had ideological reservations, as he “hate[s] the mix of visual & data markup. Better to just have blocks of RDF (in N3 for preference) in an element next to the item being talked about, or just in the page“. Like me, Stephen Downes seems to be willing to investigate and asked for “links that would point specifically to an RDFa syntax used to describe events?“. Michael Hausenblas provided links to two useful resources: W3C’s Linked Data Tutorial – on Publishing and consuming linked data with RDFa and a paper on “Building Linked Data For Both Humans and Machines” (PDF format). Pete Johnson also gave some useful comments and provided a link to recently published work on how to use RDFa in HTML 5 resources. Like Stephen Downes I thought it would be useful to begin by providing richer structure about events. My experiments therefore began by adding RDFa markup for my forthcoming events page. As the benefits of providing such richer structure for processing by browser extensions appear to be currently unconvincing my focus was in providing such markup by a search engine. The motivation is therefore primarily to provide richer markup for events which will be processed by a widely-used service in order that end users will receive better search results. My first port of call was a Google post which introduced rich snippets. Google launched their support for Rich Snippets less than a year ago, in May 2009. They are described as “a new presentation of snippets that applies Google’s algorithms to highlight structured data embedded in web pages“. Documentation on the use of Rich Snippets is provided on Google’s Webmaster Tools Web site. This provides me with information on RDFa (together with microdata and microformats) markup for events. Additional pages provide similar information on markup about people and businesses and organisations. Although I am aware that Google have been criticised for developed their own vocabulary for their Rich Snippets I was more interested in carrying out a simple experiment with use of RDFa than continuing the debate on the most appropriate vocabularies. The forthcoming events page was updated to contain RDFa markup about myself (name, organisation and location of my organisation, including the geo-location of the University of Bath. For my talks in 2010 I replaced the microformats I have used previously with RDFa markup along the providing information on the date of the talks and their location (again with geo-location information). No changes where noticeable when viewing the page normally. However using FireFox plugins which display RDFa (and microformat) information I can see that software is able to identify the more richly structured elements in the HTML page. 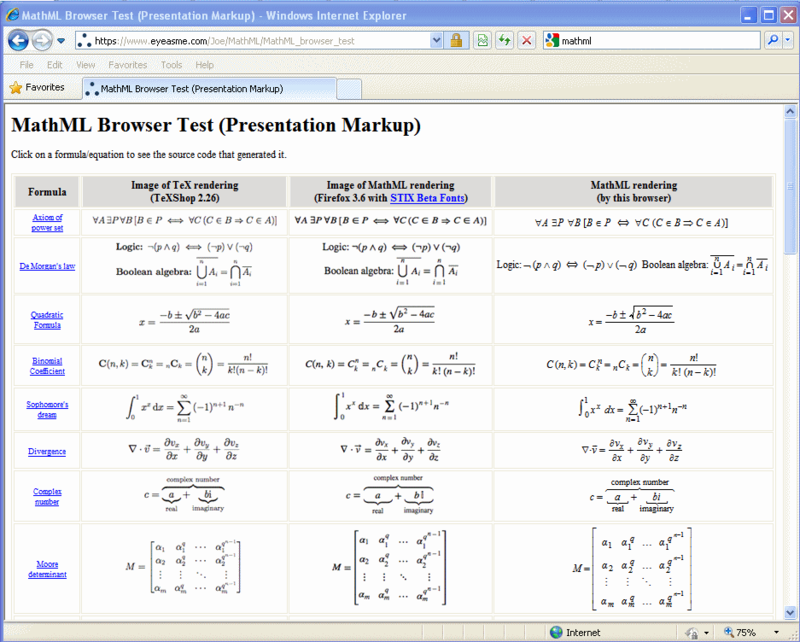 The screenshot shows how the markup was rendered by the Operator sidebar and the RDFa Highlight bookmarklet and, in the status bar at the bottom of the screen, links to an RDFa validator and the SIOC RDF Browser. If you compare this image with the display of how microformats are rendered by the Operator plugin it will be noted that the display of microformats shows the title of the event whereas the display of RDFa lists the HTML elements which contain RDFa markup. The greater flexibility provided by RDFa appears to come at the price of a loss of context which is provided by the more constrained uses provided by microformats. It was possible for me to do this as I have access to the HTML page including elements defined in the HTML . I am aware that some CMS applications may not allow such changes to be made and, in addition, organisations may have policies which prohibit such changes. On subsequently validating the page I discovered, however, HTML validity errors. It seems that my use of name="foo" attribute has been replaced by id="foo". The changes to the DTD and the elements and the inclusion of the RDFa markup weren’t the only changes I had to make, however. I discovered that the id="foo attribute requires "foo" to start with an alphabetic character. I therefore had to change id="2010" to id="year-2010". This, for me, was somewhat more worrying as rather than just including new or slightly modified markup which was backwards-compatible, I was now having to change the URL of an internal anchor. If the anchors had started with an alphabetic character this wouldn’t have been an issue (and I would have been unaware of the problem). However it seems that a migration from a document-centred XHTML 1.0 Strict conforming world to the more data-centric XHTML 1.1+RDFa world may result in links becoming broken. I was prepared to make this change on my pages of forthcoming and recent events and change links within the pages. However if others are linking to these internal anchors (which I think is unlikely) then the links with degrade slightly (they won’t result in the display of a 404 error message; instead the top of the page will be displayed, rather than the entries for the start of the particular year). Using Google’s Rich Snippets Testing Tool it is possible to “enter a web page URL to see how it may appear in search results“. The accompanying image shows the output of this tool for my events page. This shows the structure of the page which Google knows about. As Google knows the latitude and longitude for the location of the talk it can use this for location based services and it can provide the summary of the event and a description. Following my initial experiment my former colleague Pete Johnston (now of Eduserv) kindly gave me some feedback. He alerted me to W3C’s RDFa Distiller and Parser service – and has recently himself published posts on Document metadata using DC-HTML and using RDFa and RDFa 1.1 drafts available from W3C. Using the Distiller and Parser service to report on my event page (which has now been updated) I found that I had applied a single v:Event XML element where I should have used three elements for the three events. I had also made a number of other mistakes when I made use of the examples fragments provided in the Google Rich Snippets example without having a sound understanding of the underlying model and how it should be applied. I hope the page is now not only valid but uses a correct data model for my data. I should add that I am not alone in having created resources containing Linked data errors. A paper on “Weaving the Pedantic Web” (PDF format) presented at the Linked Data on the Web 2010 workshop described an analysis of almost 150,00 URIs which revealed a variety of errors related to accessing and dereferencing resources and processing and parsing the data found. The awareness of such problems has led to the establishment of the Pedantic Web Group which “understand[s] that the standards are complex and it’s hard to get things right” but nevertheless “want[s] you to fix your data“. There will be a similar need to avoid polluting RDFa space with incorrect data. The experiences with microformats would seem to indicate that benefits of use of RDFa will be gained if large scale search engines support its use, rather than providing such information with an expectation that there will be significant usage by client-side extensions. However the Google Rich Snippets Tips and Tricks Knol page state that “Google does not guarantee that Rich Snippets will show up for search results from a particular site even if structured data is marked up and can be extracted successfully according to the testing tool“. So, is it worth providing RDFa in your HTML pages? Perhaps if you have a CMS which creates RDFa or you can export existing event information in an automated way it would be worth adding the additional semantic markup. But you need to be aware of the dangers of doing this in order to enhance findability of resources by Google since Google may not process your markup. And, of course, there is no guarantee that Google will continue to support Rich Snippets. On the other hand other vendors, such as Yahoo!, do seem to have an interest in supporting RDFa – so potentially RDFa could provide a competitive advantage over other search engine providers. But, as I discovered, it is easy to make mistakes when using RDFa. So there will be essential to have an automated process for the production of pages containing RDFa – and there will be a need to ensure that the data model is correct as well as the page being valid. This will require a new set of skills as such issues are not really relevant in standard HTML markup. I wonder if I have convinced Owen Stephens and Chris Gutteridge who expressed their reservations about use of RDFa? And are there any examples of successful use of RDFa which people know about? Note that if you have an interest in applying the potential of RDFa in practice my colleagues Adrian Stevenson, Mark Dewey and Thom Bunting will be running a 90 minute workshop session on “RDFa from theory to practice” at this year’s IWMW 2010 event to be held at the University of Sheffield on 12-14 July. If you visit my presentations page you will see a HTML listing of the various talks I’ve given since I started working at UKOLN in 1996. The image shown below gives a slightly different display from the one you will see, with use of a number of FireFox plugins providing additional ways of viewing and processing this information. This page contains microformat information about the events. It was at UKOLN’s IWMW 2006 event that we made use of microformats on the event Web site for the first time with microformats being used to mark up the HTML representation for the speakers and workshop facilitators together with the timings for the various sessions. At the event Phil Wilson ran a session on “Exposing yourself on the Web with Microformats!“. 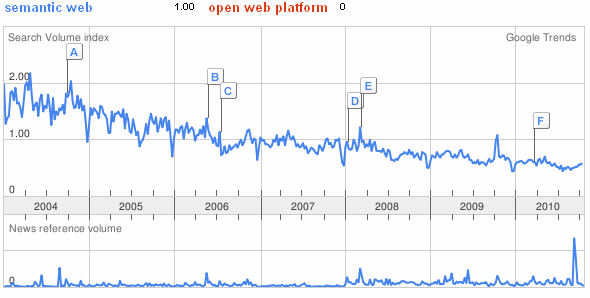 There was much interest in the potential of microformats back in 2006, which was then the hot new idea. 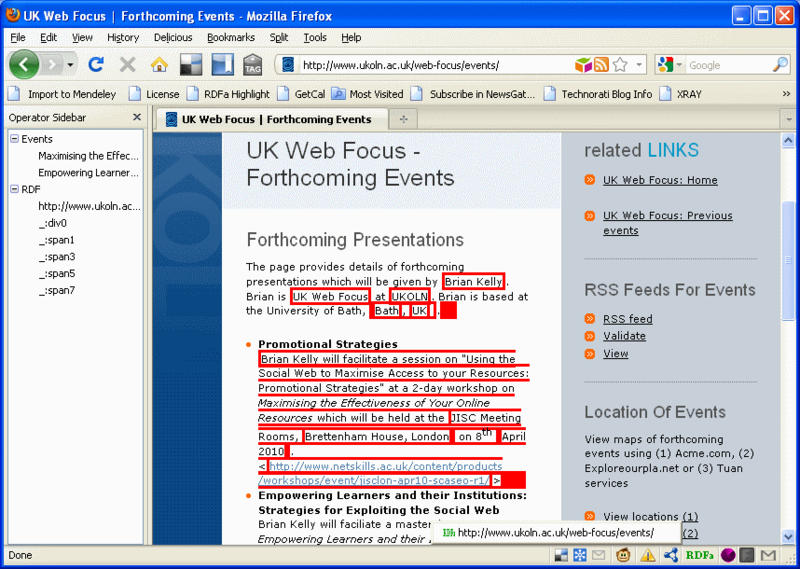 Since then I have continued to use microformats to provide richer structural information for my events and talks. I’ll now provide a summary of the ways in which the microformats can be used, based on the image shown above. 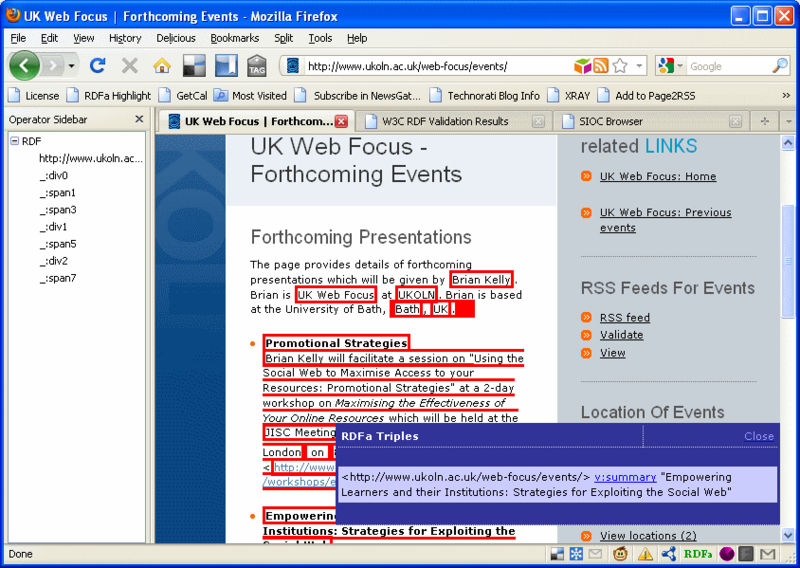 The Operator sidebar (labelled A in the image) shows the Operator FireFox plugin which “leverages microformats and other semantic data that are already available on many web pages to provide new ways to interact with web services“. The plugin detects various microformats embedded in a Web page and supports various actions – as illustrated, for events the date, time and location and summary of the event can be added to various services such as Google and Yahoo! Calendar. The power is in the rel=”license” attribute which assigns ‘meaning’ to the hypertext link. The link to my Google Calendar for each of the events (labelled C) is provided by the Google hCalendar Greasemonkey script. Clicking on the Google Calendar icon (which is embedded in the Web page if hCalendar microformatting markup is detected – although I disable this feature if necessary) will allow the details to be added to my Google Calendar without me having to copy and paste the information. The additional icons in the browser status bar (labelled D) appear to be intended for debugging of RDFa – and I haven’t yet found a use for them. The floating RSS Panel (labelled E) is another GrreaseMonkey script. In this case the panel does not process microformats or RDFa but autodetectable links to RSS feeds. I’m mentioning it in this blog post in order to provide another example of how richer structure in HTML pages can provide benefits to an end user. 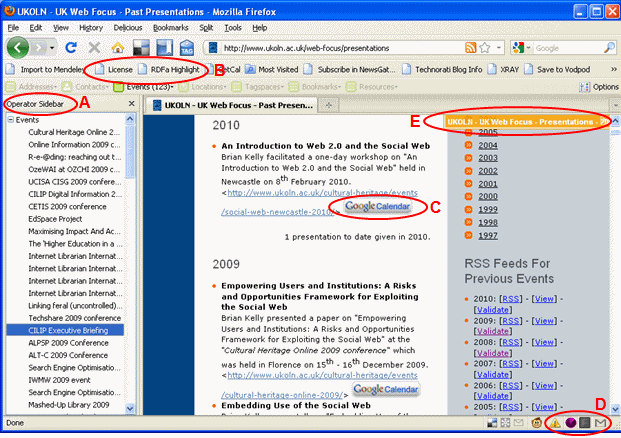 In this case in provides a floating panel in which RSS content can be displayed. The approaches I’ve described above date back to 2006, when microformats was the hot new idea. But now there is more interests in technologies such as Linked Data and RDF. Those responsible for managing Web sites with an interest in emerging new ways of enhancing HTML pages are likely to have an interest in RDFa: a means of including RDF in HTML resources. The RDFa Primer is sub-titled “Bridging the Human and Data Webs“. This sums up nicely what RDFa tries to achieve – it enables Web editors to provide HTML resources for viewing by humans whilst simultaneously providing access to structured data for processing by software. Microformats provided an initial attempt at doing this, as I’ve shown above. RDFa is positioning as providing similar functionality, but coexisting with developments in the Linked Data area. The RDFa Primer provides some examples which illustrate a number of use cases. My interest is in seeing ways in which RDFa might be used to support Web sites I am involved in building, including this year’s IWMW 2010 Web site. The first example provided in the primer describes how RDFa can be used to describe how a Creative Commons licence can be applied to a Web page; an approach which I have described previously. However this would not be appropriate for an event. What would be useful would be to provide information on the host information for the speakers and workshop facilitators. In previous year’s such information has been provided in HTML, with no formal structure which would allow automated tools to process such institutional information. If RDFa was used to provide such information for the 13 years since the event was first launched this could allow an automated tool to process the event Web sites and provide various report on the affiliations of the speakers. We might be then have a mechanism for answering the query “Which institution has provided the highest number of (different) speakers or facilitators at IWMW events?“. I can remember that Phil Wilson, Andrew Male and Alison Kerwin (nee Wildish) from the University of bath have spoken at events, but who else? And what about the Universities which I am unfamiliar with? This query could be solved if the data was stored in a backend database, but as the information is publicly available on the Web site, might not using slightly more structured content on the Web site be a better approach? When we first started making use of microformats I envisaged that significant numbers of users would be using various tools on the browser to process such information. However I don’t think this is the case (and I would like to hear from anybody who does make regular use of such tools). I have to admit that although I have been providing microformats for my event information, I have not consumed microformats provided by others (and this includes the microformats provided on the events page on the JISC Web site). This isn’t, however, necessarily an argument that microformats – or RDFa – might not be useful. It may be that the prime use of such information is by server-side tools which harvest such information form a variety of sources. 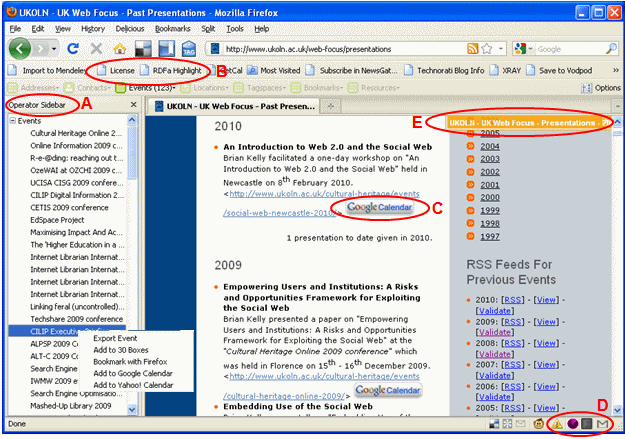 In May 2009, for example, Google announced that Google Search Now Supports Microformats and Adds “Rich Snippets” to Search Results. Yah0o’s SearchMonkey service also claims to support structured search queries. What benefits can this provide? I’ve given one use case, but I’d be interested in hearing more. What vocabularies do we need to use and how should the data be described? 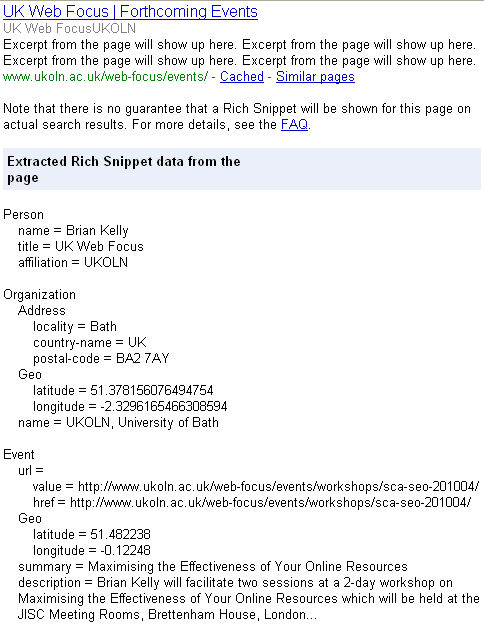 The RDFa Primer provides some example, but I am unsure as to how to use RDFa to state that, for example, Brian Kelly is based at the University of Bath, to enable structured searches of all speakers from the University of Bath. What tools are available which can process the RDFa which we may chose to create? Anyone have answers to these questions? As Erik Duval commented on my recent report on the CETIS Future of Interoperability Standards meeting, “it would be very useful to have more explicit criteria for the success (and, as pointed out in the meeting, for the failure!) of open standards“. Coincidentally the IETF have recently set up a wiki which aims to summarise successful and unsuccessful IETF standards. The wiki page on Applications Area is the most interesting for me, although the IETF’s views on applications (MIME, IMAP, HTTP, etc.) differs from mine! MIME, POP3 and HTTP seem to be regarded as successful (ranked ++ or ++>) whereas Atom is only ranked ‘+’ and AtomPub gets a ‘-‘. In the Web area what might be regarded as the successful and unsuccessful standards? And how do we judge when a standard is successful or unsuccessful? In a previous post I asked “Why Did SMIL and SVG Fail?” These, then, are two standards developed by the W3C which have failed to live up to their expectations and my blog post suggests reasons for such failures. But what general criteria might be used for identifying successful and unsuccessful Web standards? My attempt to seek an answer to this question is to look at some of the standards themselves and to consider whether they might be regarded as successful or unsuccessful and use this as a means of identifying the appropriate criteria. HTML is clearly a successful W3C standard. It is widely deployed and has been widely accepted in the market place with a wide range of creation and viewing tools available, both as open source and licensed products. The HTML standard has also evolved over time, with standards published for HTML 1, HTML 2, HTML 3.2, HTML 4 and XHTML 1, and the HTML 5 standard currently being developed. The XHTML 2.o proposed standard in contrast, illustrates a failed attempt to provide an alternative development path for HTML which addressed shortcomings in the original series of HTML standards by removing the need to provide backwards compatibility with existing standards and viewers. Observations: The benefits of simplicity and market acceptance can trump the technical elegance of alternative which do not have a clear roadmap for significant deployment. CSS is another W3C standard which can be regarded as successful. Unlike HTML, however, it had a somewhat difficult birth, having to compete with presentations tags which became standardised in HTML 3.2 and the flawed support in browsers which were at the time widely deployed (e.g. early version of the Netscape Navigator browser). Despite ongoing support problems (which nowadays relate to versions of the Internet Explorer browser) CSS is widely regarded as the most appropriate way of described ways in which HTML structural elements should be displayed in a Web browser. Observations: Despite an overlong gestation period, standards may eventually become widely accepted. XML can be regarded as another successful W3C. Interestingly since the XML 1.0 specification was ratified in February 1998 there have been four further editions which have addressed various shortcomings together with a release of XML 1.1. There have also been two edition of XML 1.1, which provides independence from specific Unicode versions. The W3C Web site states that “You are encouraged to create or generate XML 1.0 documents if you do not need the new features in XML 1.1; XML Parsers are expected to understand both XML 1.0 and XML 1.1.“. Obervations: Successful standards may be stable and not require regular developments to provide new features. The RSS family of standards is somewhat confusing, with RSS having several meanings, with RDF Site Summary and Really Simple Syndication describing RSS 1.0 and RSS 2.0, which are independently managed forks in the development of the syndication format developed by Netscape and known, at one stage, as Rich Site Summary. The IETF has developed a complementary standard known as Atom, which has attempted to address the confusions caused in the forking of the standard and the uncertainties related to the governance of RSS 1.0 and RSS 2.0. Despite the confusions behind the scenes RSS is widely accepted as a stable and mature syndication standard, with RSS feeds being provided as standard by many blogging platforms. RSS is also increasingly used by other applications and development environments, such as Yahoo Pipes!, provide environments for developers to process RSS feeds. Observations: Despite confusions over the multiple versions and governance, the simplicity provided by RSS has been valuable in its success. Observations: Although competition between software vendors may initially result in interoperability problems, such competition may also help to demonstrate that there is a role in the marketplace for a new standard, with interoperability problems being resolved afterwards. Will The SVG Standard Come Back to Life? In November 2008 I asked “Why Did SMIL and SVG Fail?” The post suggested reasons why the W3C’s Scaleable Vector Graphics standard (which became a W3C recommendation in 2003) had failed to be widely deployed in the market place. In the comments to my post a number of people pointed at the lack of support for SVG in Microsoft’s Internet Explorer as a significant factor in SVG’s failure to be adopted. Despite the economic gloom the new year has seen some good news with the announcement by Patrick Dengler, Senior Program Manager of the Internet Explorer Team that “Microsoft Joins W3C SVG Working Group“. And as described in an article on “Microsoft joins IE SVG standards party” published in The Register: “Commentors responding to Dengler’s post overwhelmingly welcomed Microsoft’s move, with people hoping it’ll lead to SVG support in IE 9“. So what are the lessons regarding a standard released in 2003 for which it takes 7 years before a company which appears to be essential for its successful deployment shows interest. And even if IE 9 does have support for the standard how long will it be before the user community discards the legacy browsers such as IE 6, 7 and 8. Let’s not forget that there is still significant usage of IE 6. The lesson: we tend to be too over-optimistic of the benefits of open standards and their take-up. The response: we need to take a risk assessment and risk management approach to standards.